Most young people in Akron can’t imagine what it must have been like to live here when Akron really was “The Rubber City”—when Goodyear, Firestone, B.F. Goodrich and General Tire were rolling out tires 24/7, and an acrid soot settled daily on the lawns of many neighborhoods. No one really cared; that pungent smell was the smell of money. It filled the air and kept our local economy rolling. For those of us in middle age who have lived here for most (or all) of our life, that is just a distant memory. We take some solace in the fact that Goodyear’s headquarters remain, some racing tires are still made in Akron, and the scattered parts and pieces of other rubber companies can be found here and there. A book I recently read called Akron “the Rubber Industry’s Rome”— was a great analogy- if you think of an industry at the height of its centralized power, and our fast-growing city as the center of a robust economic empire. Today, the vestiges of that empire can still be seen, with what’s left of the hulking tire factories being re-purposed and rehabilitated for a new century. Rome may have its Coliseum, The Forum and Pantheon. We have The Rubber Bowl, old tire factories and The Airdock. But if these represent our Rome, Akron has its Troy as well. Another empire, almost as great, lies just beneath our grassy fields, muddy hill sides and parking lots. Before Akron was The Rubber Capital, it was a Great American Kiln—a major center for clay products like sewer pipes, bricks, building tiles, pottery and more. Starting in Middlebury and slowly branching out into other parts of the city, the clay products industry dominated the town and set the stage for much of its later growth. There were vast deposits of high quality clay in and around Akron, and when William Robinson came here from Staffordshire, England, in the 1850’s, he made good use of it, along with the fellow Englishmen who joined him. By the time the Civil war started, they had established a sizable factory at East Market St. and Case Ave., known as the Summit Pottery Works. Just as the rubber industry found its destiny in the invention of the automobile, the clay sewer pipe industry found its future riding on the nationwide investment cities were making during the late 19th century, to build up their infrastructure and eliminate disease caused by sanitary issues. Robinson’s company adopted his name, becoming Robinson Clay Products, and other companies were formed to take advantage of Akron’s natural resource. In addition to the Middlebury works, Robinson built two more huge factories, one on the east end of North Forge Street and another giant facility on South Martha Avenue – not far from where Goodyear’s headquarters are now. The shallow valley at Middlebury was filled with factories along Case Ave. and on Bank St.; there were large sewer pipe works where Dave’s Market is located; pottery factories in south Akron, east and west of Bellows Streets, and stoneware factories in University Park, on Fountain just south of Carroll St. Besides Robinson, the names included Buckeye Sewer Pipe Co., American Sewer Pipe Co., American Vitrified Products Co., Summit China Co., Akron Fire Brick Co., Ohio Stoneware Co., United States Stoneware Co., L.W. Camp Co. Brickworks and Windsor Brick Co. There were many, many others. Sounds impressive. But what is left of this great industrial legacy today? Like the ancient city of Troy, most of it lies buried under layers of today’s Akron. It’s amazing to think that so many inestimable tons of large brick and stone buildings, massive round beehive kilns and giant chimneys were totally flattened to make way for the city we see today. What is also surprising is that many of the later buildings for which these clay works were demolished have subsequently been bulldozed from the landscape as well. Unfortunately, that‘s also been a large part of Akron’s legacy. Luckily, for self-styled urban archaeologists like me, the evidence is not buried too deep; in some cases, it’s not buried at all. 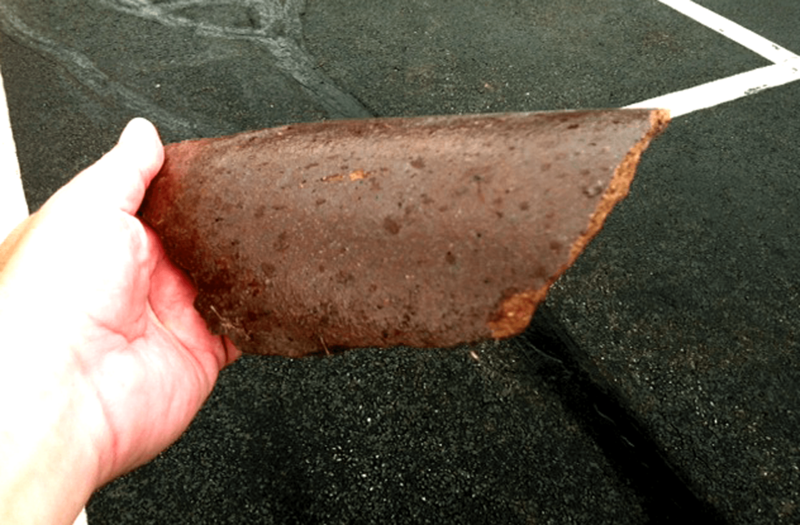 A walk along many places in Akron would reveal broken clay tiles making up a long-forgotten retaining wall, or bits of pipe exposed along a railroad track. When you come across them, you almost feel like that sharp-eyed kid who finds an old Indian arrowhead along a wooded stream. Parking at Dave’s Market in Middlebury during a recent Build a Better Block event, I found evidence of the Buckeye Sewer Pipe Co. scattered on the ground right next to the parking lot. As I left, I couldn’t resist wiping it off and tossing it into the back seat of my car. Even the giant clay pits which fed these factories lay hidden in our midst. The hillsides of Middlebury and sections of south and central Akron provided millions of tons of high quality clay, as did large holes dug out in Mogadore, Springfield and Tallmadge. Today we can just barely make them out in the landscape—low depressions or cut-outs in a hillside where no geological reason for one exists. Mack Burleson Baseball Field in Tallmadge is an example; long referred to as “The Hole”, it was a former clay pit owned by George P. Sperry, who had an interest in the Sperry, Ritchie & Co. works and American Sewer Pipe. Likewise, the land where Mason Park CLC now stands was originally a clay pit owned by Akron industrialist David Hill, who owned his own sewer pipe factory. Long seen as a hazard—due to the many people who drowned in the makeshift “swimming hole” formed by the pit, it was finally filled with trash, graded over and seeded with grass for a municipal park. Happily, two well-preserved buildings from this industrial age still remain nearby. At the end of Broad Street in old Middlebury, Sagerock Inc. has made a home in the former office building of the American Sewer Pipe Co., and a few blocks west on Market, at Buchtel Ave., we can still see the empty-but-still-impressive mansion of Byron Robinson, one of William’s descendants. It’s hard to deny that the faded remnants of this once-dominant industry speak to us of the impermanence of success. It reminds us—like Shelley’s “Ozymandias”—that even the most impressive achievements can pass away, almost without a trace. Yet it also demonstrates that no matter how great this industry may have appeared at the time, it would be far surpassed by The Rubber Boom. Little did these early industrialists know that they were just setting the table for an even bigger, better Akron. The smarts, hard work and big ideas that made that possible still exist here today. I look around now and I see lots of new faces with forks, dishes and napkins in hand. It’s time to set the table so we can sit down and eat again.